Corning: From Cookware To Gorilla Glass Corning, a 160-year-old New York manufacturer, is still developing some of the toughest glass in the world. But its focus has shifted from kitchen products to the high-tech universe, with products like Gorilla Glass, which was used on about 200 million mobile phones last year. 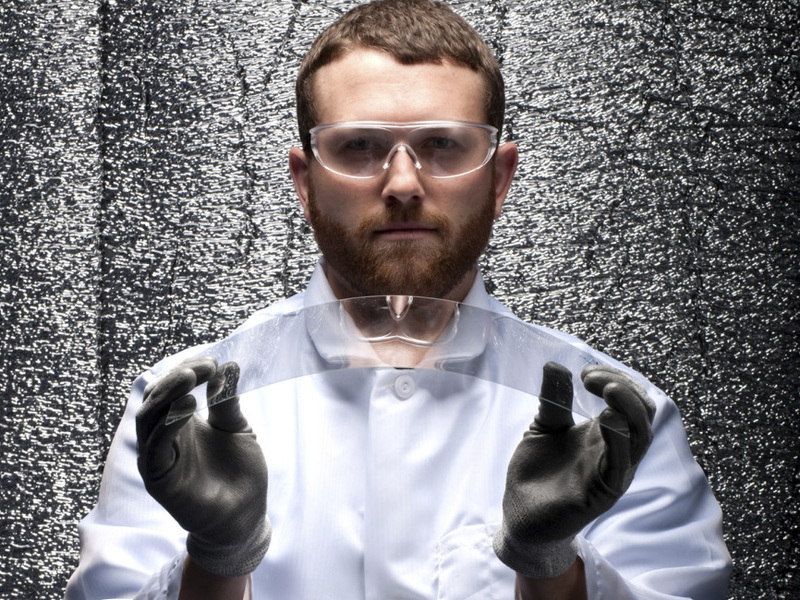 A model flexes a piece of Corning's Gorilla Glass. The shift-change whistle still sounds four times a day in Corning, N.Y. But these days, the whistle mostly reminds Corning's office workers and researchers that it's time for lunch, because almost all manufacturing is done elsewhere. Corning Inc.'s glass products used to be in most American kitchens. The 160-year-old New York manufacturer was known for glassware so tough, it was guaranteed. Corning sold off the Corelle line along with Pyrex and its other kitchen products in the 1990s, but the company is still developing some of the toughest glass in the world. Its latest rising star is the superthin and tough Gorilla Glass. Don Clark, who works in a lab that runs performance tests on Gorilla Glass, has a particular demonstration he likes to show off: He has rigged up a device to shoot a Wii remote control into a pane of Gorilla Glass. The remote hits the glass at around 60 mph, and it bounces right off. Demonstrations like this one seem to have convinced manufacturers of everything from cell phones to televisions to buy Gorilla Glass. 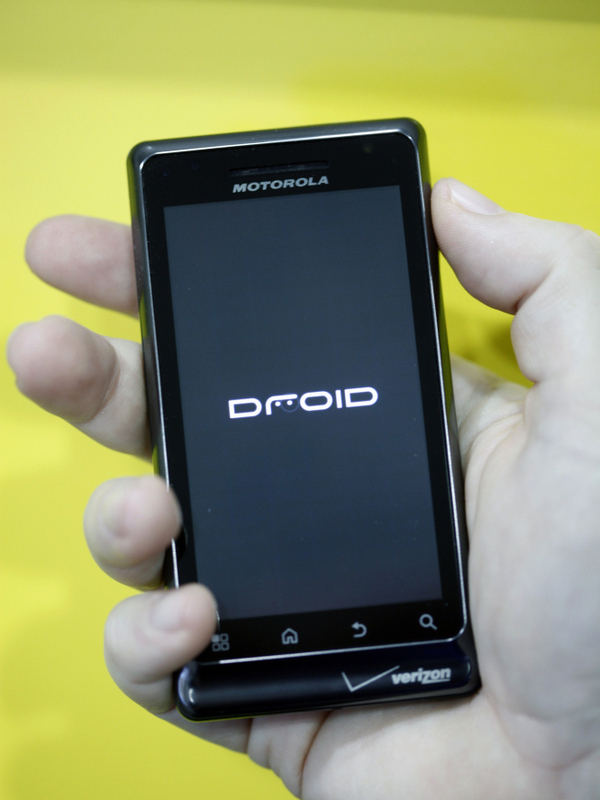 The glass was used on some 200 million phones last year. Though managers at Corning coyly say they can't confirm what Apple uses in its products, it is widely reported that much of the Gorilla Glass went to iPhones. Employees: More than 26,000 worldwide. About 40 percent of the company's employees are based in the U.S., with 4,900 in the Corning Valley. This year, Gorilla Glass sales could reach $1 billion — almost one-sixth of Corning's total sales last year. "My iPhone was actually run over, and although the back of the case was really pitted from being run over, the glass itself did not break," says Jim Kelleher, a senior analyst for Argus Research. Not every iPhone owner is so lucky, but Kelleher says there is no doubt that Corning's glass lines are strong. Corning has had bubbles burst before. But this time, Kelleher says, the company has a number of products that are in demand. The screen of this Motorola Droid smart phone was made with Gorilla Glass. About 200 million phones were made with the glass last year. Jim Flaws, Corning's chief financial officer, says Corningware was a product of the company's longtime investments in research and development at its headquarters. "We spent money on R&D, and people at the top of the company would talk about it almost as if it was a religion," he says. And while a lot of glass production occurs overseas, 40 percent of Corning employees are still in the U.S. Flaws, who got his start working in the company's housewares division, says there are no plans to move the research operation elsewhere. He says the benefits of having Corning's technical resources concentrated at its headquarters outweigh costs. Even during the recession, the company didn't cut back on its research and development, he says, because it's the company's future. Corning makes ceramic filters in upstate New York. The company is also expanding its domestic operation in Harrodsburg, Ky., to make more Gorilla Glass. And it has begun testing what it hopes will be its next big advance — glass so thin and flexible that it will be rolled up and sold on spools. This story was produced as part of the InnovationTrail project.